Mohammed is not his real name. He asked me not to share personal details, fearing retaliation from the fighters he passes when he walks around his city. I can say only that Mohammed is a Kurd living in Afrin, a city in northern Syria that was held for more than five years by Kurdish-led forces until it was, about three weeks ago, overrun and occupied by the Turkish army and its proxy forces fighting under the umbrella of the Syrian National Army (SNA), formerly known as the Turkish-backed Free Syrian Army (FSA). To be a Kurd in Afrin, once a majority Kurdish city, Mohammed says, is now to find oneself a member of a despised group, suspected of disloyalty, and liable to be robbed, beaten, put to flight, or worse. In its seventh year, the Syrian civil war has seen the warring parties and their foreign sponsors foster and exploit ethnic and sectarian divisions in order to realize their strategic ends. The looting and ethnic cleansing of Afrin by Turkish-backed militias is the latest ugly episode of this grim and cynical logic. Afrin is known for its olive trees. In happier days, a friend sent me a bar of its famous olive oil soap, stamped with calligraphy, that he had bought at a market in northern Iraq. After the Syrian regime withdrew in 2012, Afrin and the surrounding district became one of three cantons governed by the PYD, a Kurdish Marxist-Leninist party whose armed wings, the YPG and the all-female YPJ, became America’s partners in liberating Raqqa from ISIS. Afrin’s population swelled with Kurdish and Arab refugees seeking the relative peace of a region that had never been subjected to aerial bombardment, starvation sieges, or factional internecine warfare. On January 20, Turkey launched an invasion of Afrin, with the ostensible objective of taking out “PKK-PYD-Daesh terrorists”—a conflation of enemies that makes no sense, since thousands of the PYD’s fighters have died over the last five years in a brutal war against Daesh (the Arabic name for ISIS). Turkey’s name for its military campaign—Operation Olive Branch—was just as disingenuous. Over the past six years, the PYD has worked closely with the United States, and occasionally with Russia and the Assad regime, but none of these allies came to its defense when Turkish forces advanced into Afrin. (On April 3, President Trump announced that the US military would immediately withdraw its troops from Syria, then backtracked the next day. Only France has responded to the Turkish aggression by pledging to send troops to reinforce the PYD-held city of Manbij, about seventy miles to the east.) Turkish planes bombed Afrin unmolested by Russian anti-aircraft defenses. By mid-March, Turkey and the SNA had reached the outskirts of Afrin city. Over megaphones, the PYD called on civilians to evacuate. They promised that the YPG and YPJ would fight the invaders from street to street, but this last stand never was. Instead, the YPG and YPJ melted away, sparing Afrin the enormous numbers of civilian casualties that, in this war, have always resulted from resistance to state forces (although at least 300 Afrin civilians were, all the same, killed over the course of Operation Olive Branch). That night, Mohammed met three young YPG fighters, nervously searching for a vehicle in which to flee, and led them to a parked car. He stayed up, listening to a ragged concerto of artillery fire and air strikes. The Turkish army would have journalists with them, he reckoned. Because of this, he hoped, they would enter the city peacefully. I knew Mohammed through his former classmate, Sara, whom I met in 2016 when she was stuck in a refugee camp on the Greek island of Samos. Sara had taught middle school in Aleppo, and she used to delight in the student field trips she had led to Afrin, her hometown. She flicked through the photographs of those happier times while we sat on the floor of a caravan that she and her husband shared with a large Kurdish family. Lacking a cradle, the mother bounced her new baby on her outstretched legs. “Afrin,” the mom called her child: a tiny girl with glistening eyes, born so far from her namesake. Sara’s family stayed behind in Afrin, even after smugglers conveyed Sara to Germany. A few weeks after Operation Olive Branch began, she sent me photos via WhatsApp of her family’s destroyed home. They had fled in the cold rain to sleep in nearby orchards—a few more to add to the wave of 137,070 people who, according tothe United Nations Office for the Coordination of Humanitarian Affairs, have been displaced by the invasion. “The biggest calamity is that no one intervenes,” she told me. “Where is Unicef? Where is the public opinion? We are human beings and must have our human rights.” This has been the most ubiquitous and, apparently, the most futile refrain of the war in Syria. On March 18, Turkey took Afrin’s city center. Photos of the events soon flooded social media. Though far from the worst violations of the war, the scenes were emblematically dismal. Fighters from the SNA fired their rifles into the air at Afrin’s main roundabout, snapping selfies with their free hands. They ran off with looted goods, everything from goats to motorcycles and cans of mortadella—their shamelessness endorsed by religious dispensation from the Turkish-based Syrian Islamic Council. They tore down a statue of Kaveh, a legendary slayer of tyrants and the hero of the Kurdish holiday Newrooz, as if he were one of the stone Assads joyfully toppled during the early days of the Syrian revolution. If a government had wanted to stoke new hatred between Kurds and Arabs, it couldn’t have staged a better show. “They were like hyenas attacking a corpse,” Mohammed told me of the fighters he’d seen breaking into stores that night. “They did not leave a car in Afrin, except the cars of some Arabs who live here, who brought their relatives from the Free Army to protect their property.” Mohammed had to pay several bribes in an effort to save his own car. Echoing a common allegation I could not independently verify, he told me that only Kurdish properties were targeted. Later that night, Mohammed told me, two SNA fighters grabbed him in the old city center, where the market usually took place, next to the main mosque with its honey-colored dome. “Take this Kurd,” one of them, Abu Ahmed (not his real name), shouted to his friend, and he yanked the terrified Mohammed into their car. The men brought Mohammed to an empty house, where they thrust him into a room filled with men, women, and kids, most of them, like Mohammed, displaced from Afrin’s surrounding villages. Abu Ahmed’s companion pointed his gun at the group. “Are all of you Kurds?” he demanded. Convinced they were about to die, the group began to pray. But the fighters’ motives were more prosaic. They confiscated people’s cellphones, searched the house for valuables, then stole Mohammed’s car—in which, for want of a more secure place, he had hidden nearly three thousand dollars, his entire savings. “They took all I had,” he said. On his Facebook page, Abu Ahmed revealed the contours of his life. He attended Aleppo University— once known, in the hopeful days of the 2011 protests, as the University of the Revolution—and then joined the armed struggle against the government regime in Aleppo. He became the leader of a group that later folded into the Islamist-dominated rebel group al-Zenki, which developed into one of the strongest components of the Free Syrian Army in the Aleppo area. Syrian rebel groups merge and vanish like the colors in a kaleidoscope. In one of his photos, Abu Ahmed cradled his adorable sons. Another snap contains a hateful sectarian meme. In a third, he stands in front of a Greek monument. It seems that, a few years ago, Abu Ahmed took a rubber raft across the Mediterranean. Clearly, seeking asylum in Europe didn’t work out for him. Abu Ahmed comes from a village in the Aleppo countryside, some twenty miles south of Afrin, where local rebel fighters kicked out the regime. In retaliation, the regime targeted it with airstrikes throughout the war. The Syrian regime’s brutal bombing campaigns have driven many people in opposition areas to view Turkey as a protector. A few days ago, demonstrators marched in Saraqab, a town in Idlib, calling on Turkey to intervene and stop these massacres from the air. It is hardly surprising, therefore, that men from Abu Ahmed’s village went to fight in Operation Olive Branch. The “Lions,” as this group of fighters dubbed themselves, made a Facebook page on which they posted a video of themselves abusing a POW whom they called a “Kurdish pig.” This earned them many likes from their followers. Five members of Abu Ahmed’s extended family died taking part in Turkey’s Operation Olive Branch. While military occupations vary in type, they share certain approaches in common. There are house raids, like the one that happened to a family Mohammed knew. Illiterate fighters flipped through the family’s IDs, chose the one belonging to the prettiest daughter, and asked her to accompany them to pick out YPG positions. (She did not comply and, fortunately, they did not retaliate.) There are capricious checkpoint stops, routine harassments, and arbitrary demands for documents. The occupied have to try to figure out which occupier will be most receptive to their appeals—who seems less brutal or more in charge. (Mohammed told me he’d tried to approach a polite-seeming Turkish soldier who toured homes and listened to complaints about the violations of the Turks’ rebel proxies.) It becomes dangerous to take photographs. An art photographer and music teacher named Dilshan Qarojuol, who is well-known locally, was taking photos in central Afrin when she was arrested by fighters from the Sultan Murad Brigade (a predominantly Turkmen division of the Syrian National Army created by the Turkish reorganization of the FSA). The brigade is still holding her in the border city of Azaz. A spokesman for the Sultan Murad Brigade did not respond to my request for comment. There is also the erasure of local culture. Mohammed told me he saw Yezidis, members of a non-Abrahamic faith, forced by SNA fighters to carry out Muslim prayers. Dilshan Qarojuol’s musical instruments were looted under the pretext that music is haram, or forbidden. On April 4, the Afrin Media Center reported that fighters from a jihadist SNA group, Ahrar al-Sharqiya, had arrested Dr. Abdul Majeed Izzat Sheikho, the dean of Kurdish literature at the University of Afrin. Anyone suspected of being connected with the PYD (or the YPJ) is liable to be purged. The United Nations has received reports of arbitrary arrests by SNA forces. Mohammed told me about an elderly Kurdish man he knows whose three sons, still in their teens, had been arrested after SNA fighters found a bullet casing in their home. He had also heard of four young men from one family being beaten and arrested by SNA fighters simply for having done their compulsory military service under the PYD. One, Mohammed said, was taken over the border into Turkey; another man, a PYD opponent, was tortured. On March 22, Mohammed himself was stopped by fighters who demanded his passport and accused him of belonging to the YPG. He was released that time, but two days later, he again encountered Abu Ahmed, who shouted that he would come back later to arrest Mohammed. Fearing for his life, Mohammed went into hiding. But it took geopolitics to turn this bigotry into military conflict. All the main protagonists in the Syrian war have received some degree of external support. The Syrian regime is propped up by Russia and Iran; the PYD has had extensive assistance from the Americans, and occasional help from Russia. But for a Syrian rebel group, state sponsorship means survival, and the rebel groups (including radical Islamists) that make up the SNA have now devolved into subservient clients of Turkey. Turkey has recruited these rebels to fight the PYD, as part of its long war against the PKK, even if it means they leave aside their own rebellion against the Syrian regime. Turkish officials have promised to resettle between 350,000 and 500,000 refugees around Afrin. In what houses, they did not say. 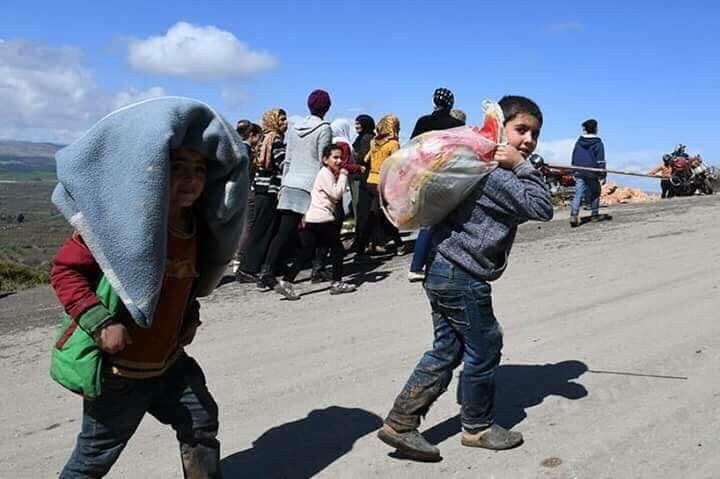 But countless Kurdish families remain stranded on the roads, blocked from returning home by the checkpoints of SNA fighters, while others, who fled to the city of Afrin during Olive Branch, are banned by the SNA from returning to their villages. The resettlement of refugees and internally displaced people in Afrin looks like one of the war’s many attempts to reshape Syria’s demography, using desperate civilians as pawns. While Mohammed places the heaviest blame on Turkey, he also believes that it is only the presence of Turkish troops that has prevented the SNA from carrying out worse atrocities. To whatever extent this is true, Turkish propaganda adds its own, self-serving spin—portraying President Erdoğan’s intervention as the return of a benign Ottoman Empire that will solve the problems of a squabbling Middle East. In the blunt words of pro-government Turkish newspaper Yeni Şafak: “Yes, we started with Afrin. We have to continue. We have to focus on great plans without caring about those trying to stop us… We have to think like the Seljuks, like the Ottomans…” A few days after the invasion, Turkey’s Anadolu Agency ran a video from Afrin in which children lined up in front of a recently reopened school and waved Turkish flags, while a man instructed them to shout “Thank you, Erdoğan.” It was as if Afrin was once again part of the Ottoman sanjak (administrative district) of Kilis. Mohammed would have sought refuge in Aleppo, but the regime has banned Afrin residents from entering the city, declaring them traitors because they lived under PYD rule. Moving between cities also requires money to pay off the militias’ protection rackets: SNA fighters demanded bribes when Mohammed’s family returned to Afrin, while pro-regime fighters demanded bribes of up to $1,000 from other Afrin residents who fled to Syrian government-controlled areas such as the city of Nubl, near Aleppo, and surrounding villages. Meanwhile, Mohammed alleged, SNA forces had confiscated homes from Kurds—an accusation of PYD membership is sufficient pretext. The theft of houses is a cruel and universally practiced tactic of the Syrian war; dispossessing people and condemning them to homelessness is as effective a way of eradicating a population as bombing it. While Sara’s family has been able to return, most of the Kurdish families Mohammed knows have fled, changing the region’s demographics, perhaps forever. The SNA has promised to punish looters and released a statement telling anyone who had “lost” possessions to submit a claim to the military court in Azaz, and mediators have promised Mohammed they will return the car stolen by Abu Ahmed. If he gets that back, he plans to sell it and everything else he owns. With the money, he said he will pay a smuggler $3,000 to take him over the Turkish border and leave behind his looted shell of a city.